It’s no April Fools' joke: there are less than two weeks left to get submissions in for the sequel to the #1 craft book in America, One-Yard Wonders. Tentatively titled Fabric Extravaganza: One-Yard Wonders the next book in the series will be geared toward sewers of all levels and anyone with a great love of fabrics. Committed sewers are prone to buying a yard of this and a yard of that, with no particular project in mind. Serious sewers know fabrics are not limited to printed cottons. Authors Patricia Hoskins and Rebecca Yaker looked at their own fabric bounties and realized many fabricaholics have a wonderful variety of fabrications waiting to be used. “We often find ourselves asking the question, how can we best use these treasures? What are the best projects for silk, taffeta, velvet, chenille, corduroy, knits, and more? Not only that, but why are we afraid to use these fabrics?” they said. Sewers are hungry for projects that go beyond printed cotton, and sewers at any skill level will enjoy expanding their fabrication knowledge and their project and skill “repertoire” while using up their existing fabric stash. With a broad range of projects, the One-Yard Wonders sequel will offer interesting and fun projects that are easy to read and understand and that appeal to the time- and inspiration-challenged sewer. No other book currently tackles these issues or expands on them with tips and techniques. This sequel to One-Yard Wonders will be divided by specific fabric types, examples of which include knits, flannel, fleece, printed cottons, faux fur/chenille, home décor/upholstery, oilcloth/coated cottons, silks/satins, woolens, corduroy/velvet, double gauze/voile, quilting cottons, denim, and seersucker, to name a few. 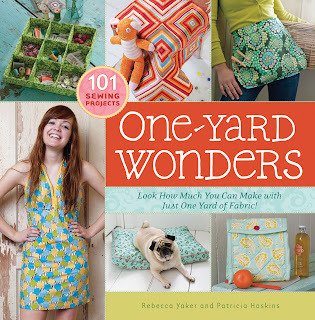 Submissions are still being accepted to be a part of the growing One-Yard Wonder series. With easy access to a delightful array of fabrications, easy-to-follow instructions and diagrams, and Hoskins and Yaker’s sassy writing style, this is sure to be another hit! For more information or to submit a project for consideration, please visit www.oneyardwondersbook.com for all the details. Working on a fleece project to submit. Have finished a prototype ... now stewing on how to make it better and get it in by 4/1! Thanks for the challenge!